Picture being able to tackle a variety of heavy-duty jobs in a capable midsize pickup truck. At Charlottetown Toyota in Charlottetown, Prince Edward Island (PEI), we house a vast array of Toyotas in stock for motorists to test drive including the Used Toyota Tacoma. Our dealership has served PEI for a number of years as one of Canada’s premier Toyota dealerships and has vehicles at our best price. Come by Charlottetown Toyota at 1 Superior Crescent and test drive a used Tacoma today. Unlike other pre-owned vehicles on the market today, a Certified Pre-Owned Toyota goes through a rigorous checklist before going on sale. Every Certified Pre-Owned Tacoma comes with less than 140,000-km on it and is less than six model years old. Our group of factory-trained specialists will perform a 127-point inspection on the pickup truck and restore any required parts with OEM components. Each midsize pickup truck also comes with a clean title and a CARFAX Vehicle History Report. In addition to undergoing a rigorous checklist, every Tacoma comes with a lengthy warranty. Every pickup truck has a 12-month/20,000-km comprehensive warranty that includes roadside assistance and a powertrain warranty. The Tacoma also has a 7-day/1,500-km exchange privilege, the first oil change at no charge and a free tank of gas. A Certified Pre-Owned Tacoma will provide you with the confidence to enjoy driving the vehicle everyday. As one of Canada’s premier Toyota dealerships, Charlottetown Toyota is recognized for our ability to get motorists into a pre-owned Toyota today. At our dealership, we have a great finance team that is capable of getting motorists an astounding rate on a pre-owned Tacoma. If you’re concerned about getting into a used Toyota because of your credit score, then spend some time with our finance team. Our finance team will secure an outstanding loan on a vehicle that works for you. Prior to visiting our dealership, explore our website and complete a finance application. At Charlottetown Toyota, you’ll get into a pre-owned Tacoma today. 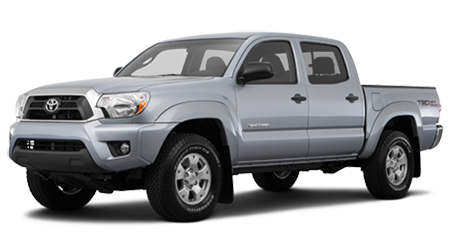 If you’ve been searching for a modern midsize pickup truck that can tackle a variety of heavy-duty jobs, then check out a Pre-Owned Toyota Tacoma. A used Tacoma has the same interior features, towing capability and versatility as a new model, but doesn’t have the new car price tag. Visit Charlottetown Toyota in Charlottetown, Prince Edward Island (PEI), at 1 Superior Crescent and discover a pre-owned Tacoma today.